Administration in the Abington Township School District released copies of two pledge agreements with $25 million donor and alumnus Stephen A. Schwarzman: the older version officially rescinded Tuesday night after public furor over the planned renaming of the high school, and a new version, to be voted on at the April 24 school board meeting. That Abington School District has released details of its revised agreement with billionaire alumnus Stephen Schwarzman, who has pledged $25 million to the district. The initial agreement – passed by the school board last month – called for Abington Senior High School to be renamed Abington Schwarzman High School. But the school board quickly reversed course after public outcry. Instead, Abington will name its new science and technology center after Schwarzman. That center – expected to open in 2020 – will be called the Stephen A. Schwarzman Center for Science and Technology. 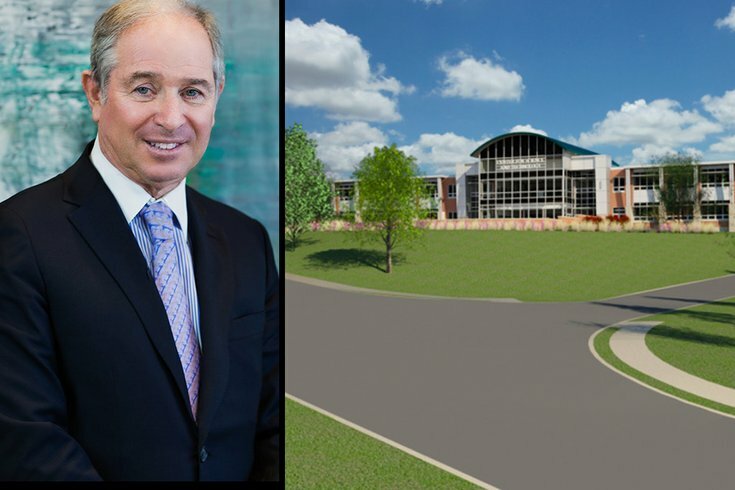 Schwarzman's $25 million contribution will be used to construct the new center and renovate Abington Senior High School, which is expected to be completed by September 2022. The school board rescinded the initial pledge agreement at a Tuesday night meeting attended by hundreds of residents and proposed an amended version with the Stephen A. Schwarzman Foundation that will be voted on at the April 24 school board meeting. At the urging of the public, the district posted both agreements on the district website on Wednesday morning. The Grantor will have the right to review and comment on the list of general contractors to be engaged by Abington, and to review and comment on the final design drawings and cost estimates, as well as any material changes thereto. The Grantor may request that Abington arrange meetings with and obtain materials from the architect, construction manager, general contractor or any other person involved in the Building Project, and Abington will use its best efforts to convene such meetings, and obtain such materials. Schwarzman would be provided with "detailed progress reports" – including a cost breakdown – and required Abington to solicit input from Schwarzman. REVISED PLEDGE AGREEMENT: Would not explicitly give Schwarzman an opportunity to participate in the planning, design or construction phases, nor does it provide him an avenue for input on the process. But it would provide for "semiannual written reports" to Schwarzman regarding the projects. RESCINDED: In addition to renaming the high school after Schwarzman, it granted those naming rights in perpetuity, as well as the opportunity to help develop a revised logo. It agreed to rename the new science and technology wing as the Stephen A. Schwarzman Center for Science and Technology, the auxiliary gym as the Billy Wilson Gym, the athletic complex as the Bobby Bryant Athletic Center and Abington's athletic hall of fame as the Coach Jack Armstrong Athletic Hall of Fame. It also called for "additional spaces ... named in honor of Mark Schwarzman and Warren Schwarzman" – the twin, younger brothers of Stephen Schwarzman. Abington agrees to prominently display a portrait of the Grantor, to be commissioned by the Grantor, in the High School. The details of the commissioning of the portrait and its display will be mutually agreed upon by ASD and the Grantor. Schwarzman is permitted to remove his name from the building at any time. Abington may do the same immediately if Schwarzman "has engaged in any act of moral turpitude which results in a criminal conviction." REVISED: The high school will remain known as the Abington Senior High School, in perpetuity. The new science and technology wing as the Stephen A. Schwarzman Center for Science and Technology, the auxiliary gym as the Billy Wilson Gym, the athletic complex as the Bobby Bryant Athletic Center and Abington's athletic hall of fame as the Coach Jack Armstrong Athletic Hall of Fame. The renaming of unidentified spaces for Schwarzman's brothers has been stricken. The locations and details of the specific manner in which the names will be displayed, as well as plaques or pictures appropriately recognizing such individual's contributions to Abington, will be mutually agreed by ASD and Grantor. Schwarzman continues to be permitted to remove his name from the building at any time, and the district has the same right if Schwarzman "has engaged in any act of moral turpitude which results in a criminal conviction." 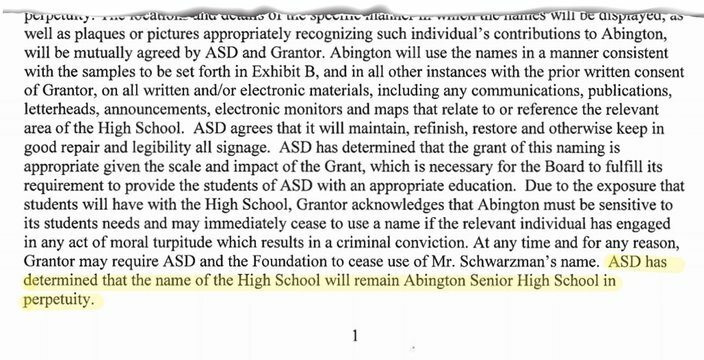 The Abington School District's new pledge agreement with Stephen Schwarzman makes clear that the Abington Senior High School name will remain in perpetuity. RESCINDED: Schwarzman agrees to pay five annual installments, beginning in 2018. The first three payments each total $6 million. The final two payments each total $3.5 million. Abington agrees that the Grantor may monitor use of the Grant through site visits and reviewing books and records – including financial documents – related to the agreement. Grantor may also require an outside audit of any or all expenses paid from the Grant Amount, the cost of any such audit to be borne by Abington. REVISED: Schwarzman's payment schedule remains unchanged, but provisions allowing Schwarzman to monitor use of the grant through site visits and review of financial documents were removed. RESCINDED: Abington will provide "an appropriate electronic device" – like a Chromebook – to each high school student beginning in September 2022. It is ASD's stated intent to make a coding ... curriculum available to all students at the High School, with the goal of 100% of students participating in a coding ... class during their high school career by 2022 and thereafter. It also provided Schwarzman semiannual progress reports, including aggregated assessment data, from coding and computer literacy skills classes. It also permitted in-person meetings to update the district's effort to meet coding and computer literacy goals. REVISED: Abington still agrees to provide Chromebooks to each high school student beginning in September 2022. And while Schwarzman will receive "semiannual written reports" regarding the initiative, there is no mention of in-person meetings. RESCINDED: A provision outlined what would happen to the naming rights if Abington High School was substantially or completely destroyed, or if it fell out of use. In such an event, "any new high school must be named" for Schwarzman. If another high school was not constructed, the district would have to recognize Schwarzman in an alternative manner. REVISED: That provision is not included.